Ariane 5 Is The European Space Launch Rocket Operated By ESA. Ariane 5 is an ESA expendable launch system. Ariane 5 rocket is a European expendable launch system. Ariane 5 is designed to deliver satellites into Geostationary transfer orbit and to send payloads to Low Earth orbit. Ariane 5 is manufactured under the authority of the European Space Agency (ESA) with EADS Astrium Space Transportation as prime contractor, leading a consortium of sub-contractors. The Ariane 5 rocket is operated and marketed by Arianespace as part of the Ariane programme. EADS Astrium Space Transportation builds Ariane 5 rockets in Europe and Arianespace launches them from the Guiana Space Centre. Ariane 5 succeeded Ariane 4, but does not derive from it directly. Its development took 10 years and cost €7 billion. The ESA originally designed Ariane 5 to launch the manned mini shuttle Hermes, and thus intended it to be "human rated" from the beginning. After the ESA cancelled Hermes, the rocket became a purely commercial launcher. Two satellites can be mounted using a Sylda carrier. Three main satellites are possible depending on size. Up to eight secondary payloads, usually small experiment packages or minisatellites, can be carried with an ASAP (Ariane Structure for Auxiliary Payloads) platform. Components of the Ariane 5 rocket. Ariane 5’s cryogenic H158 main stage (H173 for Ariane 5 ECA) is called the EPC (Étage Principal Cryotechnique/Cryogenic First Stage). It consists of a large tank 30.5 metres high with two compartments, one for 130 tonnes of Liquid oxygen and one for 25 tonnes of Liquid hydrogen, and a Vulcain engine at the base with thrust of 115 tonnes-force (1.13 meganewtons). This part of the first stage weighs about 15 tonnes when empty. Attached to the sides are two solid propellant boosters, P238 (P241 for Ariane 5 ECA), each weighing about 277 tonnes full. Each delivers a thrust of about 630 tonnes-force (6.2 MN). These boosters can be recovered with parachutes, like the Space Shuttle Solid Rocket Boosters. They may have been retrieved for examination on early missions, but are not reused. The second stage is on top of the main stage and below the payload. The Ariane 5G used the EPS (Étage à Propergols Stockables/Storable Propellant Stage), which is fueled by Monomethylhydrazine (MMH) and nitrogen tetroxide, where as the Ariane 5 ECA uses the ESC (Étage Supérieur Cryotechnique/Cryogenic Upper Stage), which is fueled by liquid hydrogen and liquid oxygen. The payload and all upper stages are covered at launch by the fairing, which splits off once sufficient altitude has been reached. Variants of the Ariane 5 rocket. The ATV will be delivered into orbit by an Ariane 5 rocket. The original version is dubbed Ariane 5G (Generic) with a launch mass of 737 tonnes. Its payload capability to Geostationary transfer orbit (GTO) was initially specified as 5970 kg, but was increased after the qualification flights to 6200 kg. The Ariane 5G+ had an improved second stage, with a GTO capacity of 6950 kg for a single payload. It flew three times in 2004. It was replaced in 2005 by the Ariane 5GS, with the same solid boosters as the Ariane 5 ECA and a modified first Stage with a Vulcain 1B engine. It can carry a single payload of 6100 kg. The Ariane 5 ECA has a GTO launch capacity of 10,000 kg for dual payloads or 10,500 kg for a single payload. 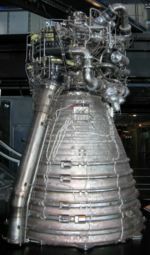 This variant uses a new Vulcain 2 first-stage engine, and an ESC-A second stage, powered by an HM-7B engine, weighing 2100 kg and carrying 14,000 kg of cryogenic propellant. The second stage was previously used as the third stage of Ariane 4; in ECA use, the tanks are modified to shorten stage length. The revised Vulcain has a longer, more efficient nozzle with more efficient flow cycle and denser propellant ratio. The new ratio demanded length modifications to the first-stage tanks. Also, the solid booster casings have been lightened with new welds, and packed with more propellant. The ESC-A cryogenic second stage does not improve the performance to Low Earth orbit compared to Ariane 5G, and for this reason the Ariane 5 ECA will not be used to launch the Automated Transfer Vehicle (ATV). The Ariane 5 ES-ATV will be used to launch the Automated Transfer Vehicle. It includes all the performance improvements of Ariane 5 ECA on EPC and EAP stages while the second stage is the EPS used on Ariane 5GS variants. Future developments of the Ariane 5 rocket. Ariane 5 ES ATV has been designed for launching the Automated Transfer Vehicle. It consists of the improved Vulcain 2-powered first stage and the upper stage from the Ariane 5G, and can put up to 21,000 kg in LEO. Ariane 5 ECB development hold. Ariane 5 ECB was planned to have an ESC-B upper stage using a new Vinci expander cycle type engine. The GTO capacity was to increase to 12,000 kg, but ECB was put on hold due to budget cuts. At an ESA conference (December 2005) in Berlin there was no decision to restart or cancel the program, meaning it is currently on hold. The Vinci engine, which is designed to power the Ariane 5 ECB upper stage, is still being developed, though at a lower pace. Consequently, a restart of the ESC-B program is not impossible at the ESA conference in 2008. The uncertainty regarding the Ariane 5 ECB creates a major commercial weakness for Ariane 5: lacking a reignitable cryogenic engine, unlike all its competitors, it is unable to deliver payloads directly to geostationary orbit. Launch history of the Ariane 5 rocket. Ariane 5's first test flight (Ariane 5 Flight 501) on 4 June 1996 failed, with the rocket self-destructing 37 seconds after launch because of a malfunction in the control software, which was arguably one of the most expensive computer bugs in history. A data conversion from 64-bit floating point to 16-bit signed integer value had caused a processor trap (operand error). 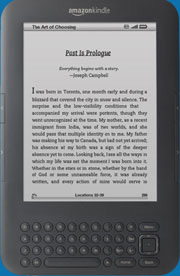 The floating point number had a value too large to be represented by a 16-bit signed integer. Efficiency considerations had led to the disabling of the software handler (in Ada code) for this trap, although other conversions of comparable variables in the code remained protected. The second test flight, L502 on 30 October 1997 was a partial failure. The Vulcain nozzle caused a roll problem, leading to premature shutdown of the core stage. The upper stage operated successfully but could not reach the intended orbit. A subsequent test flight on 21 October 1998 proved successful and the first commercial launch occurred on 10 December 1999 with the launch of the XMM-Newton X-ray observatory satellite. The next launch did not occur until 1 March 2002, when the Envisat environmental satellite successfully reached an orbit 800 km above the Earth in the 11th launch. At 8111 kg, it was the heaviest single payload to date. The first launch of the ECA variant on 11 December 2002 ended in failure when a main booster problem caused the rocket to veer off-course, forcing its self-destruction three minutes into the flight. Its payload of two communications satellites (Stentor and Hot Bird 7), valued at about EUR 630 million, was lost in the ocean. The fault was determined to have been caused by a leak in coolant pipes allowing the nozzle to overheat. After this failure, Arianespace SA delayed the expected January 2003 launch for the Rosetta mission to 26 February 2004, but this was again delayed to early March 2004 due to a minor fault in the foam that protects the cryogenic tanks on the Ariane 5. The first successful launch of the Ariane 5 ECA took place on 12 February 2005. The payload consisted of the XTAR-EUR military communications satellite, a 'SLOSHSAT' small scientific satellite and a MaqSat B2 payload simulator. The launch had been originally scheduled for October 2004, but additional testing and the military requiring a launch at that time (of an Helios 2A observation satellite) delayed the attempt. 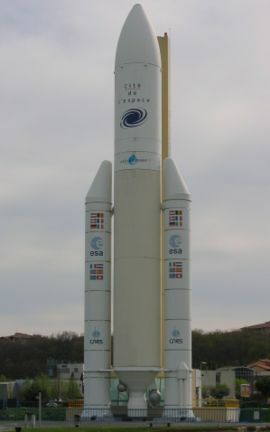 On 11 August 2005, the first Ariane 5GS (featuring the Ariane 5 ECA's improved solid motors) boosted Thaïcom-4/iPStar-1, the heaviest telecommunications satellite to date at 6505 kg http://www.skyrocket.de/space/doc_sdat/ipstar-1.htm, into orbit. On 13 October 2005, the second Ariane 5GS boosted a dual payload to orbit. This consisted of Syracuse 3A, a French military satellite, and Galaxy 15 for PanAmSat. On 16 November 2005, the third Ariane 5 ECA launch (the second successful ECA launch) took place. It carried a dual payload consisting of Spaceway-F2 for DirecTV and Telkom-2 for PT Telekomunikasi of Indonesia. This was the rocket's heaviest dual payload to date, at more than 8000 kg. 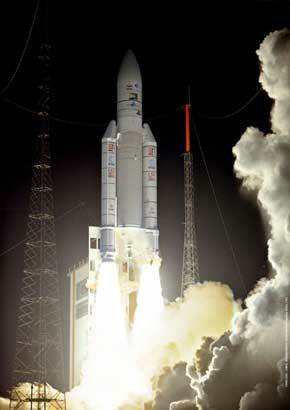 On 21 December 2005, the third Ariane 5GS boosted another dual payload to orbit. This payload consisted of INSAT 4A for the Indian Space Research Organization (ISRO), and MSG-2 for the European organization Eumetsat. On 11 March 2006, the fourth Ariane 5 ECA launch boosted another dual payload to orbit. This payload consisted of Hot Bird 7A for Eutelsat (a replacement for the Hot Bird 7 satellite lost in the first Ariane 5 ECA launch), and SPAINSAT, a Spanish government telecommunications satellite for HISDESAT. On 11 August the JCSat 10 and Syracuse 3B comsats were launched by an Arian 5 ECA. On 13 October the DirecTV-9S and Optus D1 comsats were launched, along with the LDREX-2 technology demonstration satellite. On 8 December 2006 the WildBlue-1 and AMC-18 were placed into orbit by the Ariane 5 ECA version, making the launch the fifth Ariane 5 ECA launch in 2006. Upcoming flights of the Ariane 5 rocket.